Whether you’re pointing your skis to the sleek-chic Aspen, the ultra-alpine Courchevel or the thrill-seeking Revelstoke Mountain, you’ll want to ensure you’re ensconced in a capacious chalet for après-ski relaxation. With luxury at the heart of these venues, our picks are for stylish ski bunnies who are at home rubbing shoulders with the celeb set. For decades, helicopter and cat skiers from around the world have flocked to Revelstoke, attracted by its perfect powder, varied alpine terrain and quaint mountain community. Boasting 1,713m of lift-accessed terrain, 3,121 acres of fall line skiing and phenomenally groomed slopes, Revelstoke Mountain Resort is the destination for serious skiers with a penchant for style. The region’s premier mountain home Bighorn has re-written the definition of luxury, offering stunning accommodation and exclusive access to a wilderness adventure like no other. Nestled amongst the forests at the foot of Revelstoke mountain, with beautiful views of the Columbia River below, this majestic timber-framed house is a new class of mountain retreat. Its vaulted ceilinged rooms are complete with dark wood bedroom suites, plaid-upholstered chairs and striking antler chandeliers; its social areas sport beautiful wooden sideboards, trunks, eclectic artwork and industrial pieces for a luxurious but pretension-free aesthetic. Offering everything you would ever need for a great escape, Bighorn has an exceptional range of facilities, including a cutting edge world-class spa, gym, hot tub and even a private helipad. Guests will also enjoy the use of a movie theatre – adorned with monochromatic photos of the greats – a sophisticated cocktail bar, triple-height Great Room and an unrivalled hot tub view of the mountain vista. Click here for more information. Founded as a silver-mining camp in 1879, Aspen has long been famed for its idyllic setting and popularity as a celebrity retreat. Adored by musicians and movie stars alike, it remains a popular tourist attraction today. 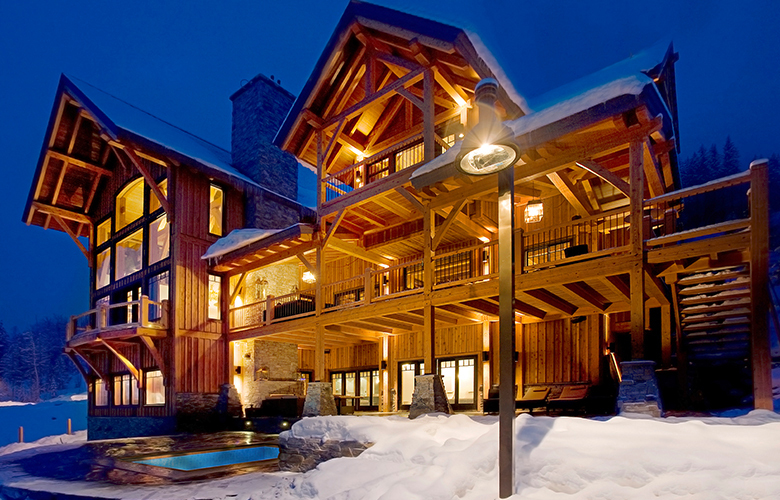 Chalet Elisa is one of the most luxurious properties in the popular Colorado destination. Located just 5 minutes from the resort centre, this 17,000ft residence house has six en-suite bedrooms, as well as staff quarters and its own office. Its style is one of refined rustic with warm accents to counteract the cool outdoors. Vibrant red button-tufted seating, two-tone sideboards, tribal patterns in plush fabrics and commanding food poster beds envelop guests in an authentically native-inspired experience. Leisure utilities include a 60ft vanishing-edge pool, media and billiard rooms, as well as a gymnasium, bar and library. With facilities to rival those of a five-star hotel, guests can also enjoy the services of a dedicated concierge, butler, porter and housekeeper, with private chef, driver, security and childcare services all available at an extra cost. The basic nightly rate for the property is currently $24,100 (US) in peak season. Click here for more information. Located in the French Alps’ Tarentaise Valley, which boasts the largest concentration of luxury ski resorts in the world, Courchevel is a haven of Michelin-starred restaurants and six-star palatial hotels. As well as being home to Saudi royalty and Russian high society, the resort is said to be a favourite haunt of the Beckhams and George Clooney, to name just a few. 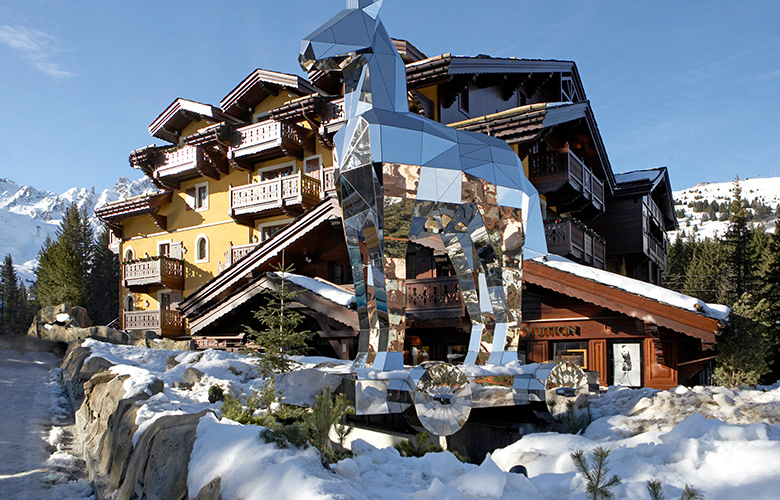 Located in the prestigious Jardin Alpin of Courchevel 1850, Cheval Blanc – a contemporary ski-in ski-out maison – is both intimate and inviting. Its 36 rooms – eight of which have been created by the celebrated interior designer Sybille de Margerie – give a new look to the traditionally rustic style. Although decorated with staple chalet textiles like cashmere, fur and leather, the modern rooms are fabulously smart and, dare we say it, unusually glamorous, for a truly unique mountain experience. Clean lined chairs are favoured over shapely silhouettes, sculptural pendant lights offer instant impact, floors are clad in lustrous rugs and glossy sculptures bedeck the suites’ tabletops. Home to The Cheval Blanc Spa, guests can enjoy signature treatments by Guerlain, including an ‘After the Snow’ treatment, designed to refresh and invigorate après-ski whilst the antler chairs and patchwork fur rugs of the Cigar Lounge – housed in a Mongolian yurt – will satisfy any needs for the traditional. Additional perks include in-house gifts including a cashmere poncho and touchscreen-friendly lambskin gloves, as well as, invitation-only collection previews for Dior and Louis Vuitton. We’re sold. Click here for more information.